Argentina are in search of their first Rugby Championship win over the Springboks since 2016 when they face off in Argentina on Saturday 25 August. With Marco Ledesma now at the helm, the South Americans will feel confident heading into Saturday’s showpiece event in Mendoza. The Argentines have only ever recorded two victories over the Springboks. The most recent was a 26-24 nail-biter in Salta, when Santiago Gonzalez Iglesias converted a penalty with two minutes remaining to give Argentina their first win against South Africa on home soil. 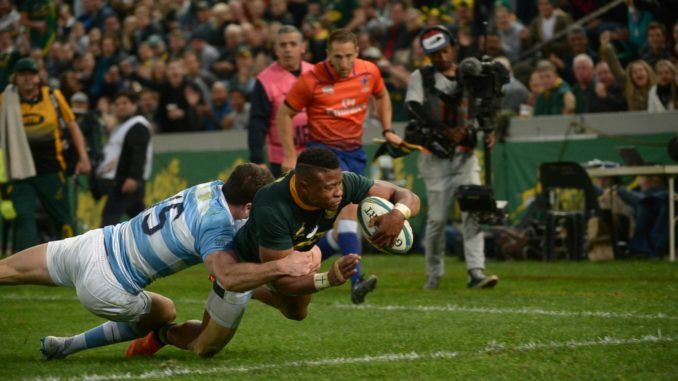 The Springboks endured a tough first half against the Argentinians in much the same way as the All Blacks battled in the first stanza against Australia, with both favourites heading into the sheds behind on the board. Both, however, would storm back to win convincingly in the second half. Argentina’s Nicolas Sanchez, the play-maker will be the key to executing many of the set pieces. His accuracy off the kicking tee will also be vital. Sanchez finished with 11 points in last weekend’s encounter in Durban. South Africa’s Faf de Klerk, the number nine made three try assists while scoring one try of his own. His vision and speed of delivery at the breakdown left the Argentine’s unprepared for the next phases of attacking play. A more clinical performance from the Boks. Rassie Erasmus won’t want them haemorrhaging late tries as they did in Durban last week. Expect the hosts to be as physical as ever with a partisan crowd behind them. South Africa – although away from home – should easily clear the low handicap. The Argentinians have yet to really find their feet against the Springboks forward pack. With go-forward ball at the breakdown coupled with South Africa’s explosive backline, I can see the visitors clearing -6.5 with ease.